Bank of America Merrill Lynch serves 97% of the 2011 US Fortune 1000 companies. In the past 12 months, BofA Merrill has focused on growing its end-to-end working capital solutions and has increased its capabilities in areas including commercial cards, ePayables and notional pooling. “The North America awards this year are particularly gratifying, given the year was characterized by market disruptions and economic uncertainty,” says Dub Newman, BofA Merrill’s head of global transaction services for North America. Citi provides payment services to all 23 countries of Latin America, and its transaction volumes in the region grew by 17% year-on-year in 2012. Meanwhile Citi’s market share reached 20% last year as measured by SWIFT transactions to and from Latin America. The bank has expanded its capabilities in a number of areas in the past 12 months. Citi’s Regional Receivables Aggregator solution is intended to provide faster and more detailed collection information in the region. Other developments in 2012 include the introduction of Remote Deposits in Venezuela, as well as bringing commercial card issuance capabilities to Peru. Deutsche Bank offers fully integrated cash management services from its branches in 14 countries in Western Europe and has a market share of 20% in terms of euro clearing. The bank has its own app-based distribution channel in the form of its Autobahn App Market. Offerings include its Liquidity Manager App, for daily liquidity analysis, forecasting, planning and management. “Deutsche Bank’s cash management division continued to profit from the ongoing ‘flight-to-quality’ trend, resulting in strong transaction volumes and higher deposit volumes, as well as from active liquidity management,” says Dieter Stynen, head of cash management corporates for Western Europe. SEB’s cash management clients include over 90% of the 100 largest corporates in the Nordic and Baltic region. It provides a range of cash management tools, including netting and currency trading capabilities as well as WebForecast, a liquidity and cash flow forecasting tool. In 2012 the bank integrated its cash management, trade finance and supply chain finance units into a transaction services offering. As well as growing its business across the Nordic region, particularly in Denmark and Norway, SEB last year expanded its services in Asia. With a presence in 19 countries in Central and Eastern Europe, UniCredit has an extensive footprint throughout the region. Seventeen percent of the group’s revenues come from CEE, and almost half of its employees are located there. UniCredit’s GTB division settles 3.5 billion payments a year and has a network covering 22 countries in continental Europe. In 2012, UniCredit launched a standardized cross-border account opening process. HSBC provides a wide range of cash management solutions across the region. In November 2011, the bank released a mobile service for corporate clients, HSBCnet Mobile, which is available in 88 countries globally, including 19 countries and territories in Asia-Pacific. In its first 19 weeks, the service was used to authorize payments to the value of $500 million in Asia. The largest international bank in the Middle East, HSBC offers cash management expertise to corporate clients in the region, including liquidity management and transaction management services as well as e-channel solutions. In 2012, the bank further bolstered its presence in the region with the acquisition of Lloyds Banking Group’s onshore retail, corporate and commercial banking business in the United Arab Emirates. Standard Bank holds a 30% market share of the cash management business in Namibia, Malawi and Uganda, as well as over 50% in Lesotho and Swaziland. The bank invests over $70 million in technology annually, and its capabilities include domestic pooling and cash concentration. Last year the bank opened a branch in Juba, South Sudan, and introduced a number of new solutions for clients. BofA Merrill offers a range of domestic and cross-border liquidity solutions, including a Global Liquidity Platform and Multi Bank Cash Concentration product. The bank’s cash concentration capabilities include intelligent sweep logic, cross-region sweeps with same-day value and multibank sweeping based on end-of-day or intraday balances. “During the past year we significantly enhanced our cash concentration capabilities,” says Greg Kavanaugh, head of global liquidity and Investments at Bank of America Merrill Lynch. Citi was the resounding winner of the Global Finance readers’ poll in this category, gaining over 38% of the vote. 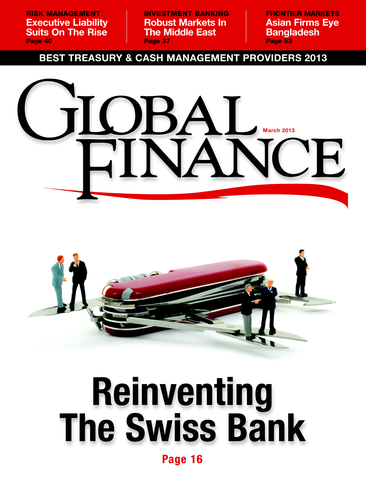 In 2012 the bank launched a multibank target-balancing solution in Costa Rica, Guatemala, Panama and Uruguay. The intraday concentration solution allows companies to automate transactions from third-party banks as well as from other branches of Citi. “Extending and enhancing our technology-based products and capabilities ... remains a key component of our business strategy,” says Carlos Castro, regional CM head for Latin America, Citi TS. When it comes to liquidity management, SEB is focusing on offering enhanced forecasting processes as well as supporting short-term investments and funding with the use of flexible solutions. The bank provides a range of cash pooling solutions within the region, including notional pooling and cross-border cash concentration. Standard Chartered grew its domestic-currency-denominated liqudity management business by more than 50% year-on-year in 2012. It is launching a global liquidity platform across Asian markets, starting with Hong Kong, that will offer solutions such as multicurrency notional pooling and enhanced cross-border sweeping. Standard Chartered provides solutions tailored to particular markets, such as shariah-compliant notional pooling, and in the past three years the balances included in its liquidity management solutions have grown by a compound annual rate of 80%. Standard Chartered is due to launch its liquidity management platform in the Middle East this year, starting with UAE in the first quarter. Standard Chartered offers sweeping as well as notional pooling with balance offset and notional interest aggregation solutions in 14 markets in Africa. The bank also provides a global revolving operating cash structure designed to optimize working capital, and third-party-bank sweeping capabilities. Standard Chartered’s global liquidity platform will be introduced to its African markets in 2013, starting with Mauritius and South Africa. Santander gained 41.8% of the votes in the Global Finance readers’ poll for Best Money Market Fund Provider in Latin America. Its global asset management business, Santander Asset Management, is present in 11 countries, including Argentina, Brazil, Chile and Mexico, and has a total of €140 billion ($187 billion) in assets under management. DB Advisors, Deutsche Bank’s asset management arm, has over $122 billion of cash assets under management. Under its Global Liquidity Series fund, DB Advisors provides subfunds denominated in euro, dollar and sterling. The funds are triple-A-rated and have a constant net asset value. Nordea provides several money market funds: Nordea Euro Money Market, Money Manager, and Pro Euro Money Market. The funds invest mainly in money market instruments and euro-denominated short-term bonds and can be used in conjunction with Nordea’s fund transfer service, which moves cash automatically into funds in order to streamline liquidity management. Raffeisen Bank International attracted an impressive 60.7% of the votes in the category of Best Provider of Money Market Funds in Central and Eastern Europe in Global Finance’s TCM reader’s survey. The Raiffeisen Liquidity Fund has shown a steady rise in returns since its launch in mid-March 2006. J.P. Morgan Asset Management’s money market funds in Asia now hold over $10 billion in assets under management. In addition to dollar, euro and British pound funds, it has funds denominated in Asian currencies, such as renminbi, yen and Singapore dollars. The largest money market fund in Egypt, Banque Misr’s Yom b Yom fund has assets under management of EGP21.3 billion—­compared with EGP9.9 billion held by its closest rival. The fund grew at a rate of 42% in 2012, up from 14% in the previous year. The Yom b Yom fund has an estimated market share of 33.4%. One of the largest money market managers in South Africa, Stanlib (a subsidiary of Standard Bank’s Liberty Group) provides a corporate MMF with a fixed-income fund rating of AA+/V1 (zaf) issued by Fitch. Standard Bank won over 58% of readers’ poll votes in this category. Citi has an established presence in Latin America, where it helps clients minimize their exposure to the risks associated with the high growth rates in the region. Citi has recently launched Mobile Collect to handle mobile-based collections in Dominican Republic. This initiative reduces the risk of fraud during the collections process as well as streamlining reconciliation and improving working capital. According to Nordea, its competence in hedging customers’ risks has helped to position the bank as a market leader for large corporations in the Nordic countries. The bank points out that its risk-weighted assets decreased during the third quarter of 2012, while its core Tier 1 capital increased to 12.2%. Citi manages over 2,400 liquidity management structures and supports over 200 multicountry Shared Service Centers in Asia Pacific. The bank draws upon an end-to-end approach to liquidity management that focuses on reducing operational risks for corporate clients while optimizing the use of local liquidity. Over 12,500 users in Asia are live on the bank’s mobile platform, CitiDirect BE Mobile, which provides access to real-time aggregated cash balances. HSBC provides a range of services that can help corporate clients in the Middle East reduce the risks associated with their cash flows. These include global payments and cash management, trade services, treasury services and corporate credit cards. Wells Fargo processed over 5.2 billion electronic payments through the automated clearinghouse network in 2011, and over 40,000 of the bank’s commercial customers use ACH services. The bank’s payment offerings include its Commercial Electronic Office portal, used by 84% of the bank’s commercial customers, as well as a CEO Mobile service that supports treasury management functions via Android, BlackBerry, iPhone and other Web-enabled mobile devices. Citi Latin America is expanding its flagship electronic banking platforms while pursuing new paperless payment and collections solutions. In addition, the bank is focusing on developing its card offerings and mobile technologies. “Corporate clients have experienced an increased need for efficient and cost-effective payments and receivables processes that generate and integrate reliable transaction data with their enterprise systems,” observes Carlos Castro, regional cash management head for Latin America, Citi Transaction Services. Positioning itself as the leading SEPA bank, Deutsche Bank offers a range of services including format conversion and local international bank account number (IBAN) conversion, and has a state-of-the-art SEPA processing engine. Deutsche Bank is also the leading euro clearer, with a market share of around 20%. “Deutsche Bank offers fully integrated services across Western Europe spanning payments services, payment clearing services and liquidity management services,” says Dieter Stynen, the bank’s head of CM corporates for Western Europe. Danske Bank is fully SEPA-compliant and provides a range of cross-border payment and collections services in the Nordic region via a single user interface. As well as providing SEPA Direct Debit collections, the bank supports domestic collections, including Autogiro in Sweden, Autogiro in Norway and BetalingsService in Denmark. Danske Bank received the highest number of votes in this category in the readers’ poll. UniCredit offers a full range of payment and collection services in CEE, including Payment System XXL for high-volume payments and urgent euro payments under ISO 20022 XML. Its UC Payment Collection solution optimizes reconciliation for high payment volumes and its Premium Collect system automates reconciliation. In 2012 the bank introduced e-invoicing services in Bosnia and created a new payment gateway in Poland. HSBC topped the votes in the readers’ poll for Asia. Last year it launched an automatic reconciliation solution for fast-moving consumer goods clients as part of its Integrated Receivables Solutions. HSBC became the first foreign bank to get approval from China’s State Administration of Foreign Exchange (SAFE) for a foreign currency cross-border netting solution. The third-largest bank in the UAE, Abu Dhabi Commercial Bank is 58% owned by the Abu Dhabi government. The bank’s cash management business has grown by 65% in three years and now accounts for 30% of wholesale banking revenues. It supports a variety of payment and delivery methods via its multichannel payment solution and provides cash, paper and electronic receivables reconciliation. An impressive 50% of corporate transactions are now initiated electronically. It supports clients throughout the region via strong banking partnerships and partners with BofAML to provide global solutions. In 2012, Standard Bank enhanced the payment capabilities of its electronic banking platform, new Business Online. “The banking environment in Africa is becoming increasingly complex,” said a spokesperson, and companies are looking to optimize cash and liquidity management.